This is the story about my 91 945 Turbo wagon that made it in the Pages of European Car magazine. It all starts when I was looking in the local paper for a Lawn tractor. I saw the ad that read Volvo station wagon turbo and the asking price. Having my old Turbo wagon totalled see picture below in a VERY bad car accident and walking away,I needed another Volvo Turbo wagon. So I called and asked the owner a few questions about the car and the two big questions I had were answered too my liking and they are,does it have a roof rack and what color and the answers where no and RED and I said I will be over too look at it ASAP wich for me was 20 minutes thats how long it took me too get to there house. 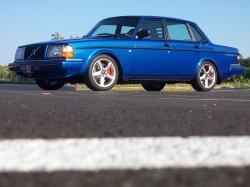 Being a Volvo technican and owning just about all the OLDER Volvo models they made has been very helpful in this journey. One each page will describe all the triumphs and FAILURES that I have had with this car. This is the brake and suspension page. This is the ONLY 940 in the U.S running the Brembo calipers and rotors from the Newer R model Volvo's. The suspension consists of coilovers front and rear Hyperco 400lbs front springs with Bilsteins and 300 lbs SSS rear springs with Bilsteins. It also has Ipd front and rear sways with a Volvo factory lower chassis brace and poly bushings throughout. In this photo the adjusters are all the way down almost touching the tire. Carlisle 2007 Well @ Carlisle the featured marque was Volvo, so more than 300 cars showed for the historic event being that Volvo also celebrated 80 years of building cars. The first Volvo was known as the Jacob and was built in 1927. The little RED wagon parked next to my stepson's Laser Blue 960..